As winter approaches, so aardvark viewing season begins. If your first question upon reading this is 'What on Earth is an aardvark? ', turn to this post for an introduction to this weird and wonderful creature. If you have heard of the elusive aardvark, then you'll understand our excitement. 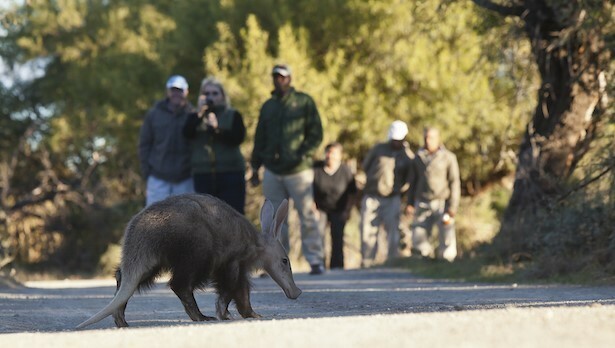 Winter at Samara is a great time to see aardvark. Due to the cold night temperatures, these usually-nocturnal animals emerge to feed on ants and termites during the day. Never seen an aardvark in the wild? Been in search of one before but it artfully evaded you? Or simply longing for a safari getaway? Take advantage of our low season rates combined with our Stay 4, Pay 3 special to visit Samara this winter. In other wildlife news, our elephant breeding herd will soon be joined by some bulls and Chilli, the female cheetah with cubs, continues to to thrill our guests as she teaches her 16-month-olds how to hunt. We will be reintroducing lions in a few months' time, and we are so excited to return these vanished kings to the Plains of Camdeboo for the first time in 200 years. Keep an eye on our blog for updates.